from the sale of this book to Syrian refugees. The Nabil Sponsorship Group in Nanaimo is a group of volunteers working to sponsor a Syrian refugee family. The family consists of a father, mother and three daughters. They are originally from Aleppo, Syria, and are currently living in Lebanon. They have a relative living here in Nanaimo. We are fundraising in the community to provide assistance for the family once they arrive in Canada. We have regular meetings and all of our work is on a volunteer basis. 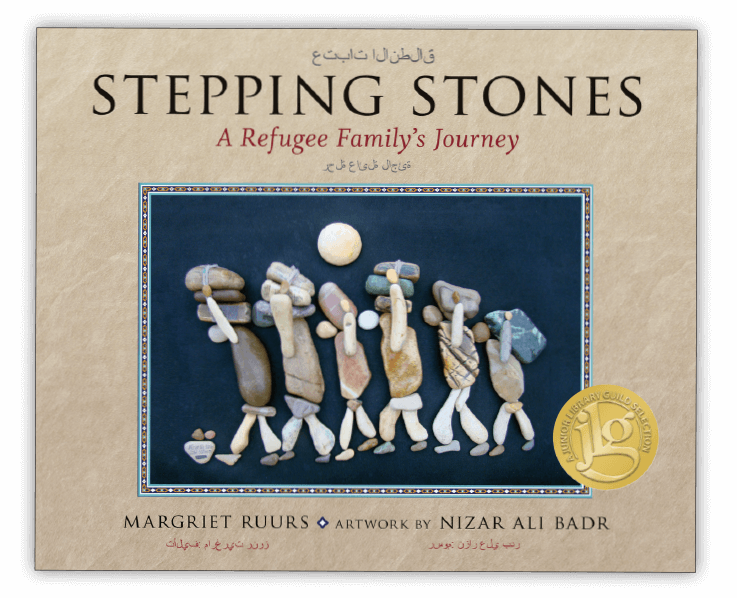 Please help us by buying this lovely illustrated book Stepping Stones: A Refugee Family’s Journey. Visit our Facebook page, Nabil Sponsorship Group, to find out how your book purchase is helping to make a difference and for information about other opportunities to support this refugee family. For every book sold $10 will be donated to our sponsorship group to help the family begin a new life in Canada. Learn the story behind Stepping Stones. Tag Orca (@orcabook on Twitter or @orcabookpublishers on Instagram) or use #SteppingStones in your social media posts so we can all spread the word.